Arrival at Port Blair in the morning by flight/ship and transfer to hotel. 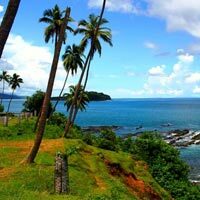 After lunch, visit the Corbyn's Cove Beach - 9 kms from Port Blair - a coconut palm fringed beach, ideal for swimming, sun-basking & bathing. In the evening, attend the enthralling Sound and Light Show at Cellular Jail - where the heroic saga of the Indian freedom struggle is brought alive. Overnight stay at Port Blair. Start after breakfast for a full-day Excursion to North Bay (Coral Island) - to see coral reefs, exotic varieties of beautiful ornamental fishes and other marine life. The glass bottom boat ride helps one to take a closer look at the vast coral colonies. Optional Activities - Snorkelling, Swimming, Trekking. In the evening, visit the Cottage Industries Emporium (Sagarika) - for Shopping & Souvenirs. Overnight stay at Port Blair. Early morning departure by inter-island ferry to Havelock Island (57 kms by sea from Port Blair). Stay here overnight amongst sandy beach and lush green forest in a comfortable beach resort. 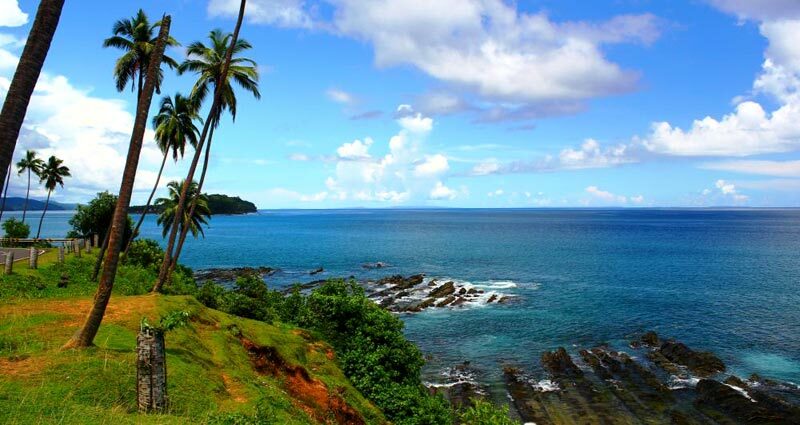 Then after lunch proceed to the Kalapathar beach where you can watch the beautiful sunset. Optional activities are swimming. Overnight stay at Havelock. After breakfast, proceed to the Asia's Best Beach "Radhanagar Beach (Beach No.7)". Return from Havelock Island in the evening and transfer to hotel in Port Blair. Honey moon cake will be placed at the resort where you are staying. Overnight stay at Port Blair. After breakfast, visit Ross Island - from where the Britisher's governed the entire A&N islands, prior to India's Independence. This island is an ideal destination for nature walk amidst sylvan surroundings with deers, peacocks, exotic birds, etc. After lunch, start for ahalf-day tour of places in & around Port Blair (City Tour) - covering the famous Cellular Jail, Chatham Saw Mill (one of the oldest & largest in Asia), Anthropological Museum, Science Centre, Naval Marine Museum (Samudrika). Overnight stay at Port Blair. After lunch, visit Chidiya Tapu - about 31 kms from Port Blair - generally known as the "Bird Island" covered with lush green mangroves and beautiful beach with breath-taking sunset - all of which creates a mesmerizing environment. Optional Activities - Swimming, Trekking. Exotic Dinner at a sea facing restaurant at Port Blair on the fixed menu. Overnight stay at Port Blair.